People are always going on about how SEO is important for their rankings, how marketing will popularize their blog, and how important updating your content with regular postings is. But if there's anything that has the most say in how successful and viral your posts will get, it's your written word. Contrary to spoken communication, writing depends solely upon the quality of words, the expressions, and the writing style, rather than your tone, your body language, and your facial expressions which are visible only in spoken communications. Your words then, are alone in conveying your message to the reader, which makes written communication somewhat more of a challenge than verbal communication. Writing online isn't easier, since there are much more distractions present. And the fact, that people nowadays are getting lesser and lesser time to read between the lines, makes the task all the more harder. The key then, as it seems to me, is to write good quality, killer content that retains and intrigues your readers. In this post, I will share some tips with you that will help you create better quality content in relatively lesser time. I am not disagreeing with the notion that SEO is not important. It is as important as anything. But you don't see poor quality content getting viral, do you? Nor will poor quality content live long, no matter what tricks you apply to it. On the other hand, good quality content will retain its life and grow in popularity with the proper nurturing. 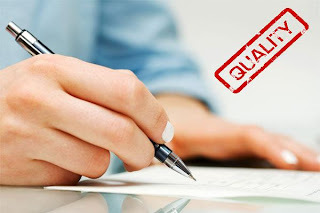 Quality forms the backbone of your blog, without which your blog will just be a limp creature hanging on to dear life! So to give rigidity to your blog, you need to create some really good quality content. If the content is king, then the title is its crown! It should be as majestic as possible, so that readers are tempted to read the rest of your article. Wherever you share your posts, whether on social networks, RSS readers, news feeds etc, the title is the one (and usually the only) thing that readers see. It should be precise, to the point, attractive, informative, and keyword-rich, all at the same time! We have a more detailed post on how to write search engine friendly post titles. You might want to check it out. One of the many challenges for an online writer is to retain a reader's attention and keep him away from distractions. One of the best way to do this is by writing precise, and to the point articles. Nobody hangs out for much details. Most people skim read your posts due to the shortage of time, so they may not be interested in what you have to say in lengthy paragraphs. Keep the paragraphs short, and precise. Discuss one idea at a time only. It should not look a random assortment or an amalgam of different ideas. Structuring your content can be a good way to go. Use headings, and subheadings wherever necessary. This makes skimming easier, and the reader can jump directly to whatever he is looking for. Also, before explaining a point, write a thesis statement at the start of a paragraph. A thesis statement is an overview of the point you are going to explain. So if someone wants to skim read your article, they can get away with the gist just by reading the first few lines from each paragraph. I know I have explained this many a times, but that doesn't make it any less important. It is like my idea of using thesis statements for individual paragraphs, but on a whole topic level. Thesis statements are there for conveying the most important point at the top of the paragraph, and then the idea can be developed in the subsequent lines. Similarly, in the inverted pyramid strategy, you state the most important point at the top, and follow up with more points in order of decreasing importance or relevance. Jargons are profession-related technical terms. Such terms can only be understood by people in that particular profession, but not people who are considered as laymen in that area. For example, the word "pointer" means everything to a software engineer. But to someone who isn't a programmer, it doesn't make much sense. Avoid using profession related jargons, especially in post titles. Readers aren't impressed when they can't understand a title. Also avoid using abbreviations in your writing. Or at least, give their full form the first time you are using them. While writing stuff, always consider the readers' point of view. Put yourself in their shoes, and ask yourself questions which they are likely to ask. Write your content accordingly. I have often found this to be a very effective strategy, as it makes me think over what things my content lacks. First of all, don't use excessive vocabulary. I know you want to impress your readers, but not all of them might be able to understand it. Keep your writing simple. Focus on grammar and structure instead. You'll benefit more form those than just vocabulary. Also, make your content more accessible to different kinds of readers. Firstly, there are the disabled readers you have to take care of. Use alt tags in images for such people, so that those who cannot see your images can know about them using special voice softwares. Also, keep your English simple, and avoid excessive punctuations so that it is easier for such people to understand. Second, you have to keep it easy for people using devices other than a computer, such as mobile users. Add image sizes that are friendly with smaller screens. For videos, make sure you provide an alternative thumbnail with link to that video on its host site, such as YouTube. Take a look at how good your old posts are doing. It often happens that some of your lists become outdated with the passage of time. Update such posts regularly, and link to them. Also check for what sort of posts are getting traffic, and what sort aren't. Write on topics accordingly. This will ensure that your content gets maximum exposure. This is where personal training with respect to time management comes in. Learn to utilize most of your free time. For example, I use the time in which I commute to and from my university to think about topics and points. I even write them down if I am not preoccupied. You can utilize your free time as well. Try to cut down on your gaming hours, and get more work done :). That is not to say you should not play games. I play games a lot. But not as much now as compared to the time I used to spend before. An important factor for writing good content is having peace of mind. For me, this is usually in my leisure or free time. During your writing, avoid all distractions. Turn off your cell phone like I do, and log off from Skype or Facebook or whatever it is that you use. There should be no interruptions in your writing process. Last, but by no means least, always write down points that occur to your mind. I'd say this is my recommended way for you to improve your content quality. One simply can not come up with all the points while sitting behind a computer screen. You need to have something pre-planned as well. Get a small notebook and always keep it with you. Or use your mobile phone to write down points. There are some good applications for Android and iPhone smart-phones, which are based on this very idea. They let you jot down points, which you can later read or synchronize with your other devices. One such application is Evernote, which is one of my favorite. 20 Hot SEO Tactics Every Blogger Must Know! WOW nice article. Keep it up. Well where is mustafa? why he is not writing article nowadays???? Good blog post I like to research keywords too google adwords keyword research tool to see what a particular keyword phrase is being searched highly before I think about a title for a blog post. Your goal is to get your blog post on the first page of Google and share it as much as possible so you have some backlinks pointing at it to increase it's visibility in the search engines. Nice post , like IT Bro!! Dear Mohammad, two links out of three you have given at the end of post are not working. Just look into it and amend it if possible. One more thing i want to know. I purchased a domain name for my blogger and converted my blog to a site. I have submitted site maps for my blog. So should I submit site map to my site also which is on same blogger. Thanks for bringing that into notice pal. If your new posts are indexed then everything is fine else you may resubmit your blog using our PHP tool for multiple sitemap submission. Great tips ahead and an advice as well. Lots of newbie bloggers are failed to become successful in blogging because there are still things they need to know. This information serves as a great help to all newbies in blogging. Thx for the such nyc post. I will be implementing it on my blog. I got anticipated for this type of write-up so I currently have attained various valuable details made by this web site I appreciate your sharing giving this level of detail.